In many ways this is the most beautiful time of year in the vineyard. So far we appear to have dodged any frosts without having to light the ‘bougies’ (hurray!) and the young shoots are growing fast. This photo of the Chardonnay vines shows the young shoot now with four or five leaves unfurled and the developing inflorescences, generally two per shoot, each of which will go on to form a bunch of grapes. Also growing fast (as I’m sure those of you with lawns to mow will know!) is the grass and weeds. So we have started regularly cutting the grass throughout the vineyard. Apart from this, the main job we’ve been doing this month is basal shoot removal. 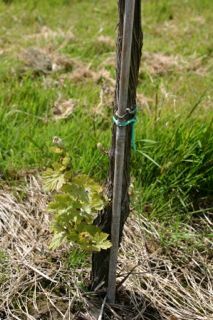 This involves rubbing off by hand all the shoots growing at the base of the vine (see photo below) which will not bear any fruit, so that the vine concentrates its efforts on the shoots growing from the fruiting cane. That’s a lot of bending down (41,000 times in fact! )… but thankfully I have help with this! In the winery we finished our 2014 vintage work with the bottling of over 12,000 bottles of sparkling base wine in one day. These are now sitting in cages in our bottle store whilst secondary fermentation gets underway. This is how the ‘bubbles’ get into ‘traditional method’ sparkling wine. Fermentation will take several months. 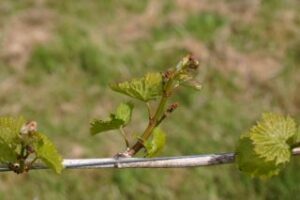 Lastly, don’t forget its English Wine Week 23–31 May with many special events and promotions going on in vineyards, restaurants and wine merchants in Sussex. We will be at Hove Lawns on 30 and 31 May as part of the Brighton & Hove Food & Drink Festival.